Super Furry Animals frontman and all-round sonic experimenter Gruff Rhys has announced details of his new project The Terror Of Cosmic Loneliness. The album sees Rhys team up with Tony Da Gatorra - a Brazilian VCR repairman, self-proclaimed 'musical freedom fighter' and inventor of his own instrument, the Gatorra, a sort of drum-machine/electric guitar crossbreed. The pair met when Rhys, who is also known for the Mercury Prize nominated electro project Neon Neon, tracked Gatorra down while travelling in South America after becoming a fan of his peace-loving protest songs. 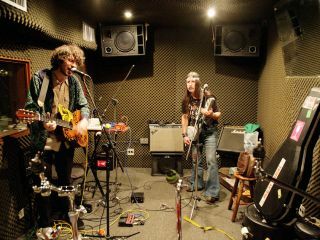 Once introduced the pair rapidly set about performing their first gig together before booking into a Sao Paulo recording studio, writing and recording the album in just under a week. "Our only shared language was music itself so there was no small talk, just intense concentration on the music," says Rhys. "On the final day, as the rehearsals had been so productive, we hooked up some recording equipment and took about five hours out to make the record." Check back this time next month when MusicRadar will be catching up with the duo to chat about the album, hopefully get our heads around what exactly a Gatorra is and maybe even try playing one. The Terror Of Cosmic Loneliness is released on 26th July via OVNI/Turnstile Music and the duo will be playing a small run of UK live dates around that time (see details below). For now you can check out the video for In A House With No Mirrors (You'll Never Get Old) above - be warned, it's just as psychedelic as you're expecting it to be!